Students who could not earn the required minimum credits at the end of the second or fourth semester have two options to continue with the studies. They may register again for the courses, when they are offered in the next academic year. However, there is also a provision to run summer courses in failed courses for these students who may register and attend the course and write the final examination. This provision is only for students who have got 45% or more in the internal evaluation for the courses they attended in the regular semester. Students should have 75% attendance in the summer course to write the examination. For the final grading their internal evaluation marks obtained in the regular semester in which they had undergone the course shall be applicable. Summer courses are to be conducted for a minimum of 20 contact hours for each course. 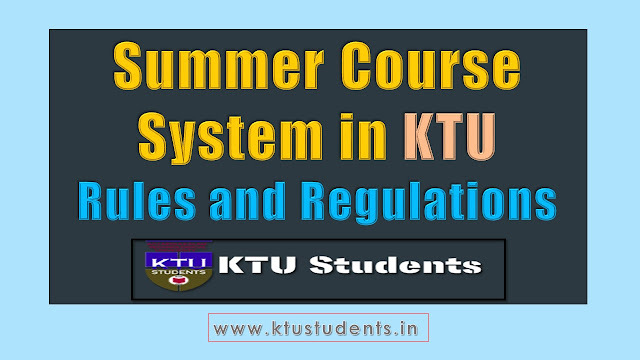 Summer courses are to be offered only at the end of the second and fourth semesters for the courses covered till that semester. They will be conducted either by all colleges or only by some, depending on the number of students registering for them. Details of summer courses planned will be announced by the colleges after the declaration of the even semester results. Final examination for summer courses will be conducted by the University. Based on the availability of faculty and the number of students opting for courses, it will be the prerogative of the colleges to decide on the summer courses to be offered. has 50% or more attendance in the regular study. 75% attendance in summer course is mandatory. Not permitted to write Internal make up test*. 45% in the regular study. 2. Permitted to write the internal make up test*. 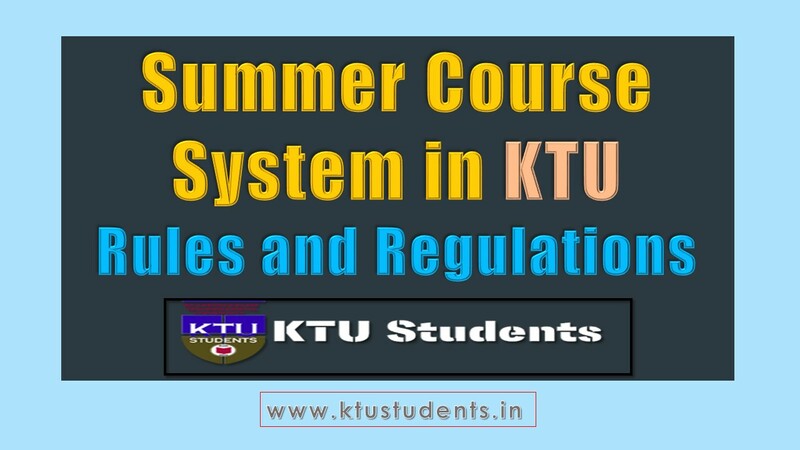 These are the possible academic conditions of students under KTU who may directed to summer courses to gain eligibility to appear university examinations. Always remember when a student directed to summer course he/she will loose one regular chance to appear examination and they have to clear the course with one and only supplementary chance. Students are advised to avoid this situation, this may bring adverse effect on your academics and you may failed to gain minimum credit requirement.